Rapid advances in technology are enabling companies to create memorable and personalized experiences for customers at scale. This vision of companies selling experiences is now becoming a reality. The breakthrough has been made possible by the explosion in connectivity, the advances in analytics and artificial intelligence, and the growing profusion of smart devices and sensors that we have witnessed over the past few years. This new reality is forcing companies to reconsider whether their current revenue models and offerings are adequate to stand out from the competition. The move from offering products to offering experiences shifts the focus from outputs to outcomes, whether for the individual or for wider society. 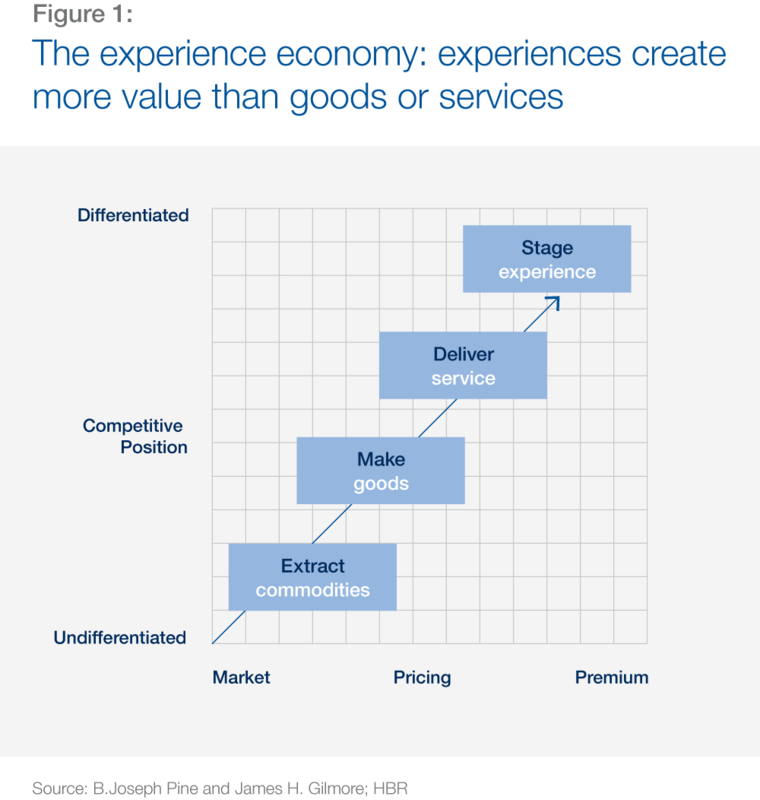 The experience economy is one of four themes that we believe will be central to the digitization of the consumer industries over the next decade. The other themes we examine are consumer data flow and value capture, omni-channel retail and digital operating model. For hyper-personalization to be successful, operating models need to become more flexible and companies may also need to implement a cultural change. Investments in areas such as data mining, analytics and production processes are needed. The potential rewards for businesses could be substantial, with personalized products and memorable experiences translating into brand loyalty and the opportunity to charge a premium. Hyper-personalization, while beneficial for consumers and companies, could have a potential environmental downside by increasing the amount of packaging material used, waste generated or delivery miles incurred. Burberry first launched a made-to-order catwalk as part of London Fashion Week show in 2013. It offered a personalization service that allowed consumers to order products and have their name engraved into the coat tag or bag plate. Similarly, Fendi is manufacturing ‘personalized handbags’, offering customers the opportunity to create a one-of-a-kind handbag by selecting the color and material and having their name or initials woven into the body of the bag. With recent advances in technology, the digital economy is now able to deliver a wider range of services and experiences that people are looking for. Uber epitomizes this preference for a service: it is more convenient to pay a small fee and summon your chosen vehicle and ‘personal chauffer’ with a couple of taps on a smartphone than to buy a car, make sure it is properly fueled and insured, and find somewhere to park it. Offering services to complement products enables businesses to develop a longer-term engagement with their customers. With that engagement comes the potential for newer methods of capturing value and the chance to build strong customer loyalty. Companies that manage to create unique, personalized and memorable experiences for their customers will generate the most value. It’s been forecast that by 2018, B2B sellers that incorporate personalization into digital commerce are set to realize revenue increases of up to 15%.⁴ This requires investment in service design and possibly also in the physical environment where the experience will take place. Samsung decided to introduce health-related sensors, such as pedometers, in some of its latest smartphones. These phones help users track exercise schedules, food intake, weight, sleep patterns and heart rate. A health wearables company, Fitbit, allows users to share their health outcomes and compete with a community of friends. Products of this kind encourage a healthy lifestyle, and the experience helps drive health outcomes for societies dealing with malnutrition or obesity. For companies entering what could be a booming segment of the consumer market, a key point of differentiation will be how credibly they can market real health benefits to consumers. A crucial capability for these firms will be the ability to demonstrate transparency in their supply chain, nutritional data and products. The consumer industries are one of six sectors (along with automotive, electricity, healthcare, logistics and media) that have been the focus of the World Economic Forum’s Digital Transformation of Industries (DTI) 2016 project. An overview of the DTI program can be found here. Our in-depth findings about the digital transformation of the consumer industries are available in a white paper, which can be downloaded here. To explore a selection of related articles and case studies, please select one of the tags below.